People don’t seem to embrace global measures of temperature rise (~0.2ºC/decade) or sea level rise (> 3mm/yr) very strongly. They much prefer more iconic signs – The National Park formerly-known-as-Glacier, No-snows of Kilimanjaro, Frost Fairs on the Thames etc. As has been discussed here on many occasions, any single example often has any number of complicating factors, but seen as part of a pattern (Kilimanjaro as an example of the other receding tropical glaciers), they can be useful for making a general point. However, the use of an icon as an example of change runs into difficulty if it is then interpreted to be proof of that change. With respect to sea level, the Thames Barrier is a concrete example that has been frequently raised. The trends in its ‘raising’ have been linked to increasing sea levels and storm surges. But how often is it being raised? why? and does it give us any real insight into sea level rises on a wider basis? Looking into it, I was fortunate to get an exceptionally comprehensive set of data on the closings and reasons for them from Anthony Hammond at the Environment Agency in the UK. The results are interesting, but complicated…. The background to the Thames barrier is available here, but suffice to say it started operating in 1983, and is raised whenever there is a forecast danger of high tides, river flow and storm surges combining to threaten London. It has been raised over 100 times operationally since being constructed. Lest you think this isn’t really a problem, I recall a friend’s car being parked near the boathouses in Putney. After a particularly high tide (this would have been in 1992 maybe), she returned to the car to find it filled with river water. No amount of cleaning ever got rid of the rather pungent odour. 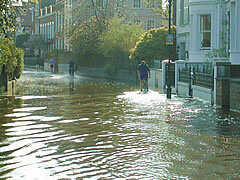 Flooding along the riverwalk in Chiswick near where I lived at the time, is frequent. And of course, the city has been flooded many times in the past – most recently in 1953 when over 300 people died. It is clear there has been a strong upswing in closings over time. The last year alone there were almost 3 times as many closing as during the first 5 years of operation put together. The three-year running mean is possibly a little clearer, showing two definite periods of more frequent closings, 1992 to 1995 and 2002 to the present. Is this a sign of increased sea level, increased storminess, increased river flow, or changes in river management policy? As always, local factors in short records are important. Over the two and half decades of barrier operation, understanding of the Thames river hydrology has grown and models are now more accurate than they used to be, allowing for more precision in decisions to raise the barrier. The decisions depend on three main factors, the river flow at Teddington (which is where the first weir is), the forecast high tide and the (more uncertain) accompanying surge. Thus if the river flow is strong, an unexceptional high tide could cause problems, while even an exceptional tide might not if the river is particularly low. In the data, closings are distinguished by whether they are due to tidal issues, or to the combined effect of tides and high river flow (fluvial), but there is not necessarily a clean distinction. In the 25 years of operation, global sea levels have risen around 5 cm, but it’s not at all clear that such a change would be registered in the very noisy extreme surges. The two peak years for closure (2001 and 2003) had very strong river flows, making the tidal threshold for closure much lower than normal. Overall, the tidal height over time associated with a closure decision has actually decreased (by about 2cm a year just looking at the tidally driven closures). This hints at a possibly increasingly risk-averse management policy, or it might reflect changes in the river models used for predictions (for instance, if including more detail increased the variance). However, the highest tides do come towards the end of the record – the very highest tides at Southend (above 3.9m) occurred in 1994, 2004 and (the highest at 4.04m) 2007. For tides > 3.7m, there were 12 in the last ten years, compared to only 3 in the first ten years in line with generally increasing sea level. However, tidal records are probably best examined directly for these kinds of statistics. The raw data for the barrier closings are available here if anyone wants to look into it further. Because the Thames River Barrier is now subject to different operating rules, it may be less useful as an indicator. The barrier is now closed to retain water in the Thames River as well as to lessen the risk of flooding. (It was closed on 9 successive tides at the start of 2003.) Thus, the number of closures has increased greatly in recent years. This indicator would only be useful if it were possible to distinguish the number of closures made specifically to lessen flood risk. My contact at the Environment Agency noted that “I have read the Defra statement that you mentioned; it seems that it is a misunderstanding or simply a poor written account of what the Barrier does. The barrier does not maintain river levels during low tides and it never has.” However, he counsels that “the pattern [of closings] is erratic and the years of operation too short for it to be an indicator of sea level rise”. To summarise, Thames Barrier closings tell a complicated story which mix climate information with management issues and are probably too erratic to be particularly meaningful – if you want to say something about global sea level, then look at the integrated picture from satellites and tide gauges. But it is a good illustration of adaptive measures that are, and will increasingly be, needed to deal with ongoing climate change. Winter’s weather today in The Marches: cold easterly wind (20–30 kph), 100% cloud cover, temperature ~1°C @ 13:00 GMT (230 m asl); forecast of possibility of snow flurries (which will bring the UK to a grinding halt). There’s enough “noise” around hereabouts without being given periodic weather updates (from either side: the believers in real climate science and the delusional, denialist blogosphere inhabitants). Kindly desist/resist the urge. Individual weather events cannot be attributed (with any statistical confidence) to either side’s arguments (whether those arguments are from the reasoned or whether they are promulgated by the delusional). P. Lewis, quite so: but you cannot distinguish between “reasoned” and “delusional” in this case; all such “arguments” are delusional. Perhaps a “mistaken enlightened” and a “plain delusional” would have been better when talking about talking about attributing weather events. But no, Rod B. There is very good phenological evidence for early springs (early flowering, etc.) and later autumns (delayed senescence) that is/approaches the scale over which climatology data are assessed statistically. Stick to weather, fine. But don’t. Enough of weather. Here are some studies citing long term trends in things like the “cherry blossoms are blooming” that seem to be pretty well researched and supported. Proc Natl Acad Sci U S A. 1999 August 17; 96(17): 9701–9704. Freeze and breakup dates of ice on lakes and rivers provide consistent evidence of later freezing and earlier breakup around the Northern Hemisphere from 1846 to 1995. I think it is pretty clear that this number is _not_ the best estimate from the TAR: For that, you would look at F.3 in the Technical Summary, where it notes that climate sensitivity is likely to be between 1.5 to 4.5 degrees C, which would be equivalent to about 0.4 to 1.1 K/Wm2. Note that 0.75 is smack dab in the middle of the range. I think the AR4 updates this by actually giving a probability distribution rather than a range(and maybe by shaving off the bottom end of the range?). Going back to #94: You might consider the following back of the envelope calculation: According to the Water Vapor: Feedback or Forcing? post, somewhere between 15 and 34% of the total forcing is attributable to GHGs other than water vapor and clouds. If we assume that water vapor and clouds are “feedbacks”, then the 33K of warming we see could possibly be attributed to between 0.15*150 and 0.34*150 W/m2 primary forcings. This would give you a sensitivity of between 1.5 and 0.65 K/Wm2, which is actually higher than the IPCC best estimates. Of course, this back of the envelope calculation is also rather crude: one expects that the water vapor + cloud response to be non-linear, and of course this doesn’t include any albedo change feedbacks (positive: less snow, glacier + arctic ice retreat, etc, or negative: increased desertification, etc.). Statements (#93) made earlier by VirgilM’s on Devils Lake need to be corrected. Devils Lake was in a state of fluctuation from January 1 of 2000 to January 1 of 2006. However, reading on January 1 of 2006, 2007 and 2008 (below) show that the elevation of Devils Lake in ft. above mean sea level, has been in a state of recession. In 2008 Devils Lake will have a short term rise (approximate 1.0 ft, or less) in the elevation of Devils but the lake elevation on January 1 of 2009 will be lowered than the lake elevation was on January 1, 2008. I’m willing to accept bets on this if there are any takers. Re: #110: Pat Neuman: I have to say, having looked at the data myself, Virgil’s arguments are fairly convincing. Personally, I think arguing about one lake (or even one hydrological region) doesn’t make much sense when looking at climate, but it seemed like the two of you were having an argument that would be easy to resolve. If I go to the USGS website http://waterdata.usgs.gov/nd/nwis/uv/?site_no=05056500 to get data, the first thing I note is that in 2005 they shifted their monitoring station because of excessively high lake levels. If I actually then _get_ the data which goes back to 1979 (though it is spotty for the first decade), it is clear that current lake levels are at historic highs: 1995 is the first year it exceeds 1430 feet, 1998 the first year it exceeds 1440 feet, and only in 2000 did it break 1446 feet – the level you list for your January “low” prediction. So I don’t understand why you are trying to defend a prediction that the level of Devils Lake is dropping, when it is at a level higher than any recorded from 1980 to 2000? Sorry, I just couldn’t resist my cold weather comment. I just get tired of hearing the news media blabbing day-in and day-out about extreme heat waves and blaming it on global warming. And just to add to Gavin’s comment to Bob Tisdale’s #112, Tamino has an excellent analysis of this very topic at Garbage is Forever and at Wiggles. Mike #113, I hope you will forgive our lack of enthusiasm for your rediscovery of Winter. It’s true that the lake tendency in the 1980s and 1990s was upward. However, that’s history. Climate change has now swung the other way – toward downward lake levels. Devils Lake observations show that the level of Devils Lake has been on a falling trend (averages for last three years falling, also see comment #110). The dropping levels are now being driven by longer ice free winter periods, longer growing seasons, warmer temperatures and higher evaporation rates. Longer growing seasons in the basin means increasing amounts of water loss from land areas due to higher rates of transpiration and evaporation – anuual inflows since 2006 have decreased. Water temperatures have been warming more rapidly than average annual air temperatures (Lake Superior). Annual lake water evaporation from the Great Lakes is greatest in fall when the water temperatures are warmer than air temperatures and due to lake effect snowfall. Devils Lake hydrology has also been complicated by human influence – for many years – including: Channel A cut in 1979, overflows to Stump Lake since 2000 and many other channel modifications within the basin. None the less, the current tendency in Devils Lake water level is recession. There is no need to create a diversion from Devils Lake to the Sheyenne River, and Red River, which has been pushed by those with little or no hydrologic knowledge of the basin. On the Great Lakes, warmer water temperatures in fall and early winter have resulted in higher losses from lake evaporation. I think my point stands: Devils Lake in North Dakota hit a record high in May of 2005, which caused significant problems around the area. Your proposed statement in 2000 made no mention of record lake levels that was broken a few times from 2001 to 2005. Your statement said that lake levels would fall becasue of human induced climate change. I suspect that your prediction is a personal opinion that you tried to get into a NWS product. If it is not, then reference me a peer-reviewed journal article that modeled the future climate in Eastern North Dakota and specifically said that lake levels will drop for Devil’s Lake. North Dakota has moved into a drought that last two years. That has happened many times in the last 1000 years. When that happens, lake levels drop because precipitation is a big part of the equation. A very small drop in lake levels in the last two years only proves that drought as moved into the area. Connecting it with human climate change takes much more work, because correlation does not mean causation. Where is that work in the journals? My experience includes hydrologic model development, model calibration and accurate annual operational forecasting the elevation of Devils Lake, 30 years, gained from first hand experience at the NOAA NWS Kansas City River Forecast Center from 1976 to 1979 and at the NOAA NWS North Central River Forecast in Center im Minnesota, officially awarded retirement for 30 years of “Loyal Service” rendered to the government of the United States by the NWS Central Region director (Feb. of 2006). Answer: NOAA NWS was a road block for publishing material related to climate and hydrologic change, in jounals, for many years. While at NWS I was told to remove reference to myself as a NWS employee on the paper below even though I had been allowed to do some of the research on the timing of snowmelt runoff shown in the paper on government time. Long term trends from the forcing are expected to be around 0.2 – 0.3 deg/decade. Therefore you need to be able to get uncertainties down to well below those values in order to find a clear discrepancy. Judging from the last thirty years, that period is around a decade. Seems to me it’s more complicated than this. If you look at the historic forcings, before roughly 1975, if climate models are to be believed, there was a rough balance between the positive forcings from CO2 and the net negative forcings associated with aerosol particles. (I use this figure from the WIki article to illustrate the balancing of these two anthropogenic forcing terms). It should be noted that industrialized nations have been reducing their CO2 intensity (ratio of CO2 production to GDP), e.g. see this [As an aside, the total US CO2 production (US CO2 production dropped by 2% in 2006. I’ve read a press account, but don’t have a more trustworthy link, that ironically Europe’s CO2 production increased by 0.4% over the same period.] Put another way the CO2 contributions from developed nations are decreasing as a percentage of the global anthropogenic CO2 budget. It should also be noted that developing nations like China are adding coal-burning electric plants at a prodigious rate (I heard as high as 1 per day). Because these facilities produce copious quantities of aerosols, one might expect the relative balance of CO2 forcing to aerosol forcing to shifting back towards a balancing of the two contributions. I don’t have ready access to global aerosol production, so please accept this as just a plausible scenario meant to illustrate a point. Obviously without the aerosol data this is pure speculation, but I’m just suggesting that it’s important to not take trends like 0.2°C per decade as gospel. People who are demanding a definite answer on this (on both sides), may simply be underestimating the complexity of the anthropogenic forcings terms. It’s a reasonable idea but you forget one crucial fact. CO2 accumulates, and aerosols don’t. That means you have a competition between a forcing which is proportional to the total emissions, compared to one that is proportional to current emissions. I’m really not trying to be argumentative, but I understand the relationship between the amount of CO2 emitted by anthropogenic processes and the change in CO2 concentration to be more complex than that. For example, there are carbon sinks that are affected by the availability of CO2 in the boundary layer: It’s a nonlinear system and it has memory. (I’m thinking of Inez Fung’s work on this.) You could have e.g. a step function change in the rate of CO2 emissions, and end up with nearly the same total concentration levels, due to the response of the other carbon sinks to the increased availability of CO2 in the boundary layer, depending on the magnitude of the step function that is. To make it clear, I wasn’t proposing that a long-term stable situation could be set up e.g. increasing our aerosol production to balance the increased CO2 concentrations. Rather I was suggesting these changing demographic patterns represents a potentially confounding effect over some short term interval (20-30 years) that could mask a very real long-term trend in global warming. How probably this confounding effect is to be seen, obviously you’re the expert on this not me. My only real point is that because of changing demographics, we might expect the net forcings from CO2 and aerosols to change over time, and potentially we could be going into a short-term lull (on climate scales, e.g., 20 years) in global warming. That is, it hasn’t stopped, just slowed by poor industrial practices in third world nations. However, this wouldn’t signify either a problem with climate models or signify a long-term end of the warming period. I absolutely agree with your other comments, I hope you weren’t trying to take my question as a “well it’s going to flatten out indefinitely, so there’s no worry.” Clearly I agree on the need to moderate both CO2 emissions and aerosol production. Faustian is a great choice of words by the way, for the other scenario (whereby global warming is stopped long-term because we produce enough pollutants to balance the increased CO2 emissions. I wasn’t proposing this idea, and obviously it would never work. Gavin — do they have an annual time series for industrial aerosols? I’ve been looking for such a thing for a while now without finding one. The link shows one chart with what seems to be annual resolution of “global sulfate emissions.” Wouldn’t that serve as an adequate proxy? Where can I find that time series? Never mind — found it. On Steve McIntyre’s web site, of all places, though his source is legitimate (Stern et al.’s work from a peer-reviewed journal article). Now I’ve got sulfate emissions to 2000 and volcanic DVI to 1995. I’d be happier if I could fill in the last few years, but hey, ya gotta go with what ya got. You mean the rising trend in the global mean temperature anomaly that’s calculated from averages of sea surface measurements and air sampling, I take it. From this data http://data.giss.nasa.gov/gistemp/tabledata/GLB.Ts+dSST.txt is that correct? I can’t see that being very exciting either, no. This thread is a bit long to follow… but I think I need to propose a slightly different and geological viewpoint. It is also maybe the old anthropic principle peeking out from under the rocks. If we look at the fossil record we can see that there are dominant species/groups of species that crop up. Chalk – coccoliths. Various other limestone facies that show how some organism has had a huge impact on the sequestration of carbon. We do not have good data for the change in atmospheric composition that might have also happened – but we do see the carbon in the rocks. Now – human beings have an obvious effect on the earth’s surface. Maybe as much effect as bamboo does. More effect than (say) cats do, so it is very liekly that we will and do effect the climate. The nasty, pessimistic geologist point is – if we do not do it some other species or set of species will and the net outcome will be the same – a shift in climate. A tiny change on the planetary scale, but significant for things clinging to the surface. We are intrinsically bound up in a complex system with a very large humber of feedback loops, time constants and trip points. No one factor or function will let us predict outcome. So – calls to save the planet by riding a bike will come to nothing. Calls to spend less on electricity by using LEDs might have a result – but only in terms of daily per-cpaita power consumption. We simply cannot make the cause-effect link between personal action and change in climate. ‘[IPCC, 2001] made an estimate of all variables and their possible contribution to sea level rise. They arrived at a mean value of 0.9 mm/year. This value is in harmony with the records of the present and near-past given in Table 2.
Who in any case is INQUA?